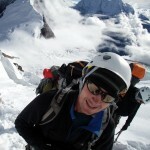 When I set out from Camp 4 at 7460m on Manaslu, it was the first time that I’d climbed with bottled oxygen. My 700 metre climb from Camp 3 the previous day had been unremittingly steep and tiring, but I completed it without supplementary oxygen while carrying a heavy pack. I half suspected my summit day would be easier. I was going to be carrying next to nothing, and although the cylinder weighed four kilos, breathing in the extra oxygen would benefit enormously, or so I’d been told. But from the start something felt wrong. I set off like an overweight tortoise, and I could walk only a few steps at a time before needing to take a rest. Some people who set off from Camp 4 at the same time were disappearing across the snow plateau ahead of me. Every so often the oxygen mask tightened across my face like a rubber plunger and I felt myself gagging. It was unclear at this stage whether I was wearing an oxygen mask or a gimp mask. I peeled it off my face and relaxed as I felt a breath of air from the outside squeeze into my lungs. The oxygen apparatus was feeling like a hindrance rather than a help, and although I was determined to keep plodding, at this rate it was going to take me much too long to reach the summit. Halfway across the plateau I stopped to let my friend Ian overtake, and my Sherpa Chongba decided to check my oxygen. He fiddled about behind my neck, where the tube from my mask met with the regulator attached to the oxygen cylinder in my pack. I imagined there was some sort of blockage in the pipe that was stopping the oxygen from reaching my mask. Whatever it was Chongba did, it had an immediate, almost magical effect. When I set off again I felt like Usain Bolt on Viagra. I positively flew, overtaking Ian and a few people ahead of him, and left them far behind. At the end of the plateau the terrain steepened to climb a 100 metre bank of snow. I sped up this without stopping, and could feel a sharp stab of pain run through my fingers and toes as the oxygen reached my frozen extremities and brought feeling back into them. Not long after this the pain receded as my digits warmed up. Now I knew what it was like to climb on oxygen, and how brilliant it felt! This magical moment didn’t last long though. Further up the mountain I had to stop for a drink. This involved taking off my oxygen mask, a fiddly operation needing manual dexterity, and I had to ask Chongba to help. When I put the mask back on and continued, the magical effects seemed to be gone, and it was a hard slog again, but at least I was well on my way now, and it took us about 5½ hours in total to reach the summit. Chongba changed my oxygen cylinder shortly below the summit, I assumed because it was harder to do so actually on the summit, but only later did I realise there might be another reason for this. Long before summit day ended I would be cursing my oxygen apparatus once again. When I started on my way down after reaching the summit, my neck and shoulders were very painful, and I realised I must have been stooping. But when I tried to stand up straight, my oxygen mask got pulled off my face, and unless I continued to stoop the only way to wear the mask was by holding it in place with my hands. By the time we reached Camp 4 I was only too glad to rid myself of the whole apparatus and continue without it. The plan had been to use it right to Camp 2, but there was just no way I was going to keep holding it in place in that awkward fashion all the way down. 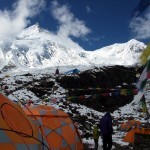 Chongba on the second plateau, with the summit behind. Wise and experienced, he was a bit like Jeeves to my Bertie Wooster. Without the oxygen I struggled down to Camp 2 in laboured fashion, and didn’t reach it till 7.30pm, well after dark. Chongba arrived so long before me he would have had time to watch a couple of movies if he’d taken an iPad up there with him. He actually did have time to melt a couple of litres of snow and climb halfway up to Camp 3 again to meet me with hot orange juice. My neck and shoulders were in agony now that I was carrying a big pack again, and there was no doubt in my mind my troubles were due to the pain in my neck rather than the lack of oxygen. Down at Camp 3 I realised the straps in my rucksack were of unequal length and my pack had been hanging sideways on my back for I don’t know how long. This was another mystery. 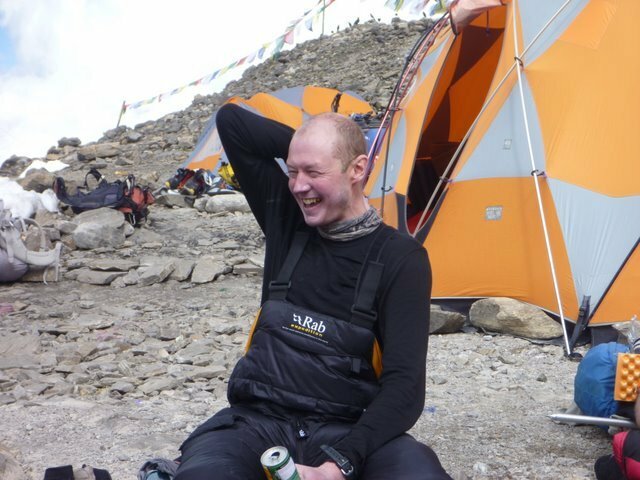 Chongba had put the oxygen cylinder in my pack at the start of the climb that morning, but it was hard to believe he would have carelessly allowed the straps to be readjusted in the process. More likely is the bottle was resting at an angle in my pack, and the straps had gradually slipped as I climbed. Whatever the explanation, but for a magical few minutes earlier in the day, the oxygen had proved a curse to me. I really hadn’t enjoyed using it at all, and in the end it had led to a very painful descent. I could barely stand up straight by the time I reached base camp, and I was stooping so much that if there were any chimpanzees in that part of Nepal they would probably have tried mating with me. I felt like I was a hundred years old, and my team mates recall being shocked by my appearance when I arrived. It took another couple of weeks for my neck to recover fully, and for a short while I worried that I may have suffered permanent damage. So what had Chongba done when he fiddled about behind my neck as we crossed the first summit plateau? I had assumed he was fixing a blockage, but it later occurred to me he may simply have turned up the flow rate. The plan had been to get ready on 0.5 litres per minute, then start climbing on 2 litres per minute. In this situation an oxygen cylinder would last for 8 hours before needing to be changed. But if necessary the flow rate could be turned up to 4 litres per minute, which would mean the cylinder lasting only 4 hours. This might explain why Chongba decided to change the cylinder before we reached the summit, rather than on the way down. What this doesn’t explain was why I started out so slowly, slower even than I’d climbed to Camp 4 with my heavy pack. Nor does it explain why I stopped feeling the benefits of the oxygen after I stopped for water. Had Chongba accidentally started me on only 0.5 litres per minute, and did he turn the flow rate down again after helping me with my mask when I stopped to drink? I may not have long to wait for an answer to these questions. 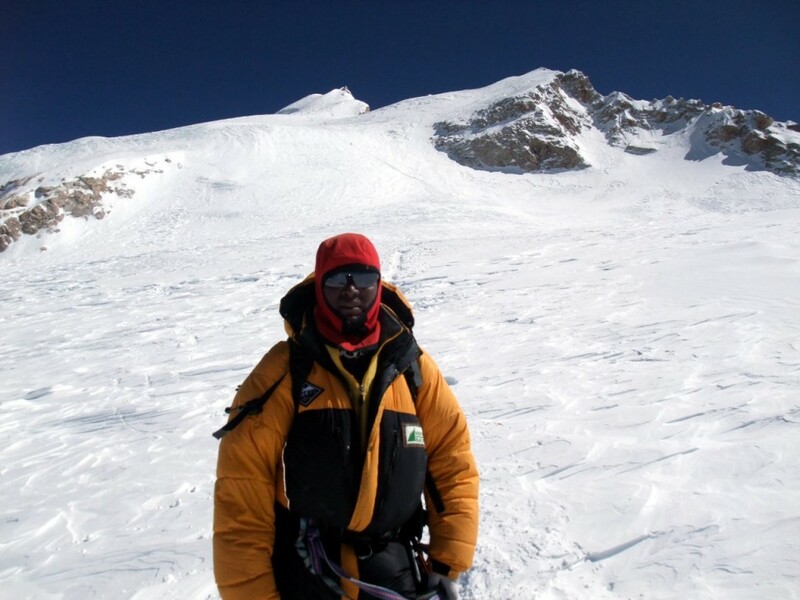 Chongba will be my Sherpa again on Everest this year, so I’ll be able to ask him. I’m very happy to be climbing with him again. 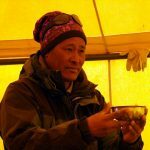 He is one of the older Sherpas who radiates a great deal of wisdom and calm. 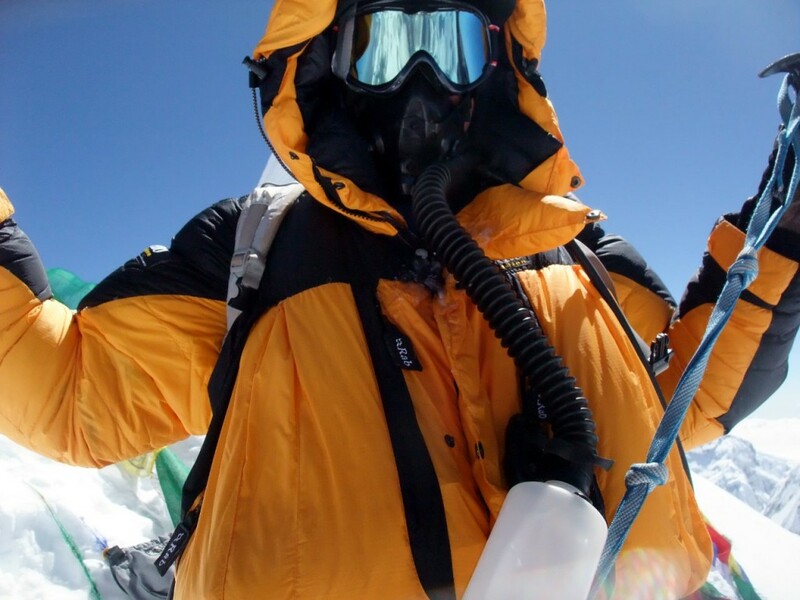 He has also climbed Everest 12 times already, so is one of the most experienced. There was an incident when we arrived at Camp 4 before summit day when he tried to take my boots off for me as I entered the tent, but my pride prevented him. “You’ve climbed Everest 12 times, Chongba. You don’t have to take my boots off for me!” I told him. In the stories of P.G. Wodehouse, Bertie Wooster probably said a similar thing to his butler Jeeves before getting drunk, making a fool of himself at the Drones Club Golf Tournament and waking up engaged to Honoria Glossop. 24 hours later I’d lost count of the number of times Chongba had helped me out of a pickle. It’s possible I might have staggered to the summit without him that day, but he certainly made it a hell of a lot easier. It’s clear that using the oxygen apparatus requires practice. 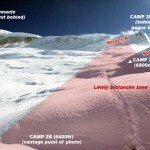 If we have a decent summit push on Everest then we’ll have much longer to get used to it than we did on Manaslu. The plan is for each of us to have 6 bottles, and begin using it during the climb to Camp 2 at around 7500m, climb with it again to Camp 3 at 8300m, then sleep on it prior to summit night. There’s still a lot that can happen before that, however. Of course, some people believe that climbing with supplementary oxygen is cheating, but by whose rules is it cheating? Certainly not mine. We all have different levels of ability, and require different degrees of assistance in terms of both people and equipment, and there’s nothing wrong with this. I won’t be trying to race up the mountain, and the only person I’ll be competing with is myself. In any case, I’ve yet to see anyone climb a mountain barefoot wearing only a loincloth, so I suppose by the rules of our ancestors even Jerzy Kukuczka – the man who not only climbed all fourteen 8000 metre peaks without supplementary oxygen, but insisted on doing all of them by a new route, solo, and preferably in winter – was a cheating toerag. As for me, I don’t claim to be the best climber in the world, or even a particularly good one. I’m just happy to be there on these amazing mountains, and the sense of achievement is secondary. If you’re interested in reading more, the full diary of my Manaslu expedition is now online, and is also available as an ebook for your Kindle.